Sometimes you just need to turn something on and off. Control lights, accessories, uncouplers, signals, motors, AC circuits. Anywhere you’d use an on/off switch. Relays are real switches. They’re fully isolated which makes them ideal to control track power, high voltage or high current circuits, lighting, and signals. Our Real-Switch Relay Bases come with two or four relay switches, each with 10 amp rated contacts, and a place to plug in a Touch Toggle to control each relay. 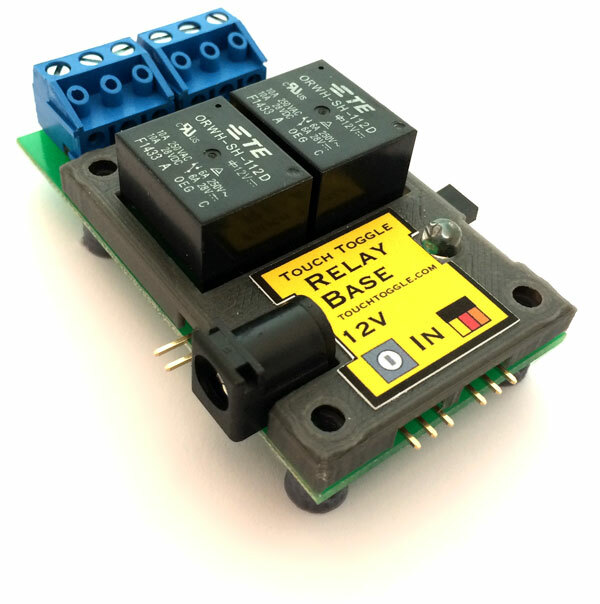 All of our relays have “double throw” action, meaning that contacts connect to one circuit when the relay is powered, and another when it is not; You will usually only need to use one side contact or the other. Each set of contacts have large screw-tight terminal blocks that are removable for easy wiring. These terminals accept 14-22 gauge wires to connect to each set of “SPDT” relay contacts. Adjacent relays can easily be linked to operate 2 or more poles together. Our Real-Switch Relay Bases use a plug-in 12v power supply. Our 12v Bases can be daisy-chained when mounted side-by-side with Relay or other 12v bases. This way power can be shared with up to 16 Touch Toggle controlled relays in a row, all by a single power supply. Handy red LEDs light up to indicate when a toggle is red and it’s relay coil is powered. Our relays have a 100% duty cycle, which means they can remain on indefinitely. Use an Input Splitter to operate a Relay Base along with a switch control! Our Input Splitter lets you control 2 or 3 inputs from the same Touch Toggle. Use a Relay Base to add contacts to any turnout! We offer handy packages of a Real-Switch Relay Base and 2 Touch Toggles of your choice (in the pop-up menu below). Momentary controls are popular for uncouplers and other press-to-operate accessories. Choose a Toggle type control to operate track blocks and lighting. We offer packages with our Mini-Cup Toggles too. These give you a ready-to-use fascia mounted touch control that mounts in a 1″ hole! Be sure to order a 12v power supply for each panel location. 12v power can be extended or shared between panels with our DC Wyes and Extensions. Choose the right Base or Package for you from the pop-up menu and set the correct quantity below.